Growth hormone deficiency, also known as the GH deficiency or GHD, is a condition related with the pituitary gland. The gland is situated at the base of a human brain and is responsible for production of hormones including the growth hormone. Growth hormone deficiency occurs due to the inability of the pituitary gland to create enough growth hormone. This results in slower growth. While the growth hormone ensures steady growth amongst children, the hormone balances the amount of muscle, body fat and bone in adults. The lack of growth hormone in children leads to slow growth; moreover, it leads to emotional symptoms like unenthusiastic behavior to work and high levels of tiredness. In adults, GH deficiency is normally related with pituitary tumors that have been tended to either through radiation or through surgery. The deficiency can affect humans at any age. However, the deficiency isn’t hereditary and normally the condition isn’t transferred from parents to children. The causes of growth hormone deficiency are normally difficult to know. The deficiency can either by congenital—the child might be born with it, or it can be a consequence of any medical condition. An injury to the brain can also be responsible for affecting the ability of the pituitary gland to produce growth hormone. Growth hormone levels may also be less amongst children who are either born with a facial or skull defect or get a facial or skull physical defect through an injury. For instance, children with a cleft palate or a cleft lip might have lesser growth hormone levels. The triglyceride levels are increased in adults with the GH deficiency which can lead to blockage of blood vessels. Moreover, low density lipoproteins are produced higher as compared to high density lipoproteins by the body in adults with the growth hormone deficiency. Doctors start to look for a growth hormone deficiency once they notice that the children’s height and weight aren’t increasing as they should. When suspecting a case of GHD, the doctorsnormally question the children’s parents about the history of growth rates amongst the family. The doctors might also ask the parents about their growth rateat the time when they were close to reaching puberty. Tests are conducted for the purpose of confirming whether the diagnosis is right or not. Blood tests are conducted at first to see the growth hormone level, though lesser levels are not enough to confirm the diagnosis as growth hormone levels frequently change between day and night every day. This is why if growth hormone level is found to be less, doctors order thyroid function and kidney tests to see the body’s production and use of the hormones. For confirming the diagnosis, hand x-rays may also be ordered,which can give an idea about the rate at which bone growth is occurring. If the doctors feel that the growth hormone level is less because of an injury to the pituitary gland or a tumor around the gland, MRI of the brain is done. This can show whether an injury or tumor is affecting the pituitary gland or not. If no such cause is found, then it is considered that the condition is congenital. The main treatment option for growth hormone deficiency is the injection of growth hormone into fatty tissues of the body. The injection site is normally either the buttocks or the back of the patient’s arm. The injections need to be administered on a daily basis. The main side effects of these injections are soreness at the site of injection, pain in the hip, scoliosis and headaches. These side effects aren’t very serious. However, in very rare cases, consistent injection of growth hormones can lead to diabetes, especially if the patient’s family has a history of diabetes. Normally, the injections are only given till the children reach puberty after which children start to produce the hormones on their own. However, in some cases, the injections need to be administered for life. Growth hormone injections work for adults as well. Similar to the case of children, the injections need to be administered daily with their side effects, including headaches, pain in the hip and scoliosis. In growth hormone replacement treatment, the adults are given injections of artificially prepared growth hormones which normally injected beneath the skin around the thighs, the buttocks or the back of the arm. The injections are injected into the body’s fat tissue. The injections are similar to insulin as the same needles are used in this treatment and no pain is felt in almost all the cases. 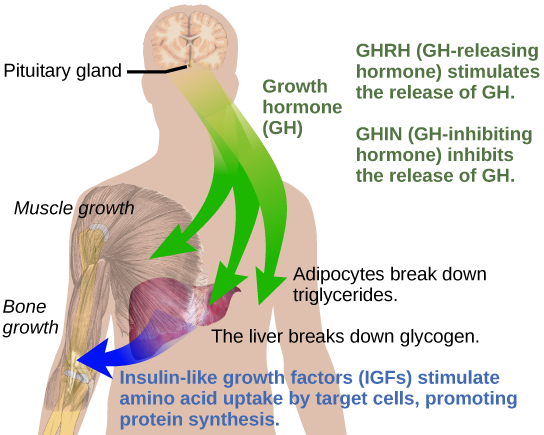 The amount of growth hormone injected depends on the growth hormone levels in the body. The levels are monitored consistently through consistent blood tests.